​about a LOT of different aspects of developing botanical art. 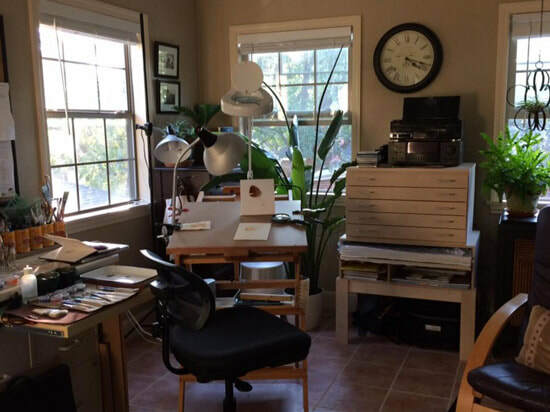 Botanical Artists are renowned for sharing their experience and expertise with one another. ​Many now do so using their websites and blogs or by writing articles for other websites. 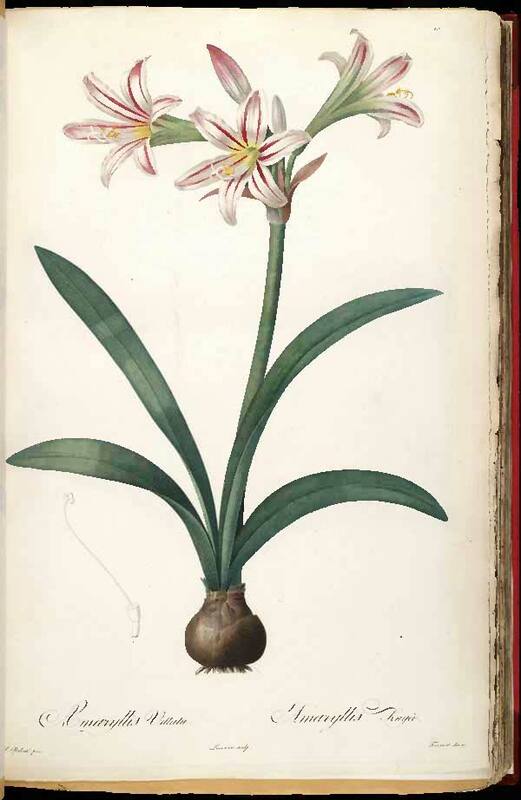 Botanically typical and accurate - The specimen chosen for the illustration is typical rather than unusual. The accuracy is derived from very close study of the plant, sometimes over the seasons (see below). Life sized or drawn to scale - Size is an important aspect of identification. Plants are usually sized and drawn at a 1:1 scale - this involves measurement during initial studies. Smaller distinguishing features may be depicted at a larger scale (see magnification below). Illustrations produced for publication on a defined plate size are typically produced larger and must indicate the relationship between the size of the drawing and the size of the published image. Includes dissections and the use of magnification - identifying a plant is based on all aspects of the plant as exhibited on the exterior and interior. The smaller distinguishing characteristics are often identified through the use of a microscope (or a magnifier/loupe in the field). Illustrations always include a precise scale bar to indicate the extent of magnification. when presented in an exhibition or a publication it is always displayed with the botanically correct name (including the Latin). Exhibits of groups of drawings or paintings are assessed first and foremost as botanical illustration. Some tips for developing your botanical art. These are based on the tips I've picked up from my interviews with artists winning RHS Gold Medals and other prestigious prizes (see links to my articles in the next section) and reading interviews with leading artists. I've tried to summarise here the lessons they've learned and are happy to share. Check out National Collections and Botanic Gardens local to you. Finding quality plants can be a challenge. Two great sources are Botanic Gardens and National Plant Collections. Think about seasons - a series of paintings of plants and flowers in the same season have impact. Cultivate a good grower. While some artists grow their own subject matter, others get their specimens from a grower. If you're planning a series you need to work out in advance with a grower what they can provide. Time and again, artists have emphasised to me how their grower can make or break a series. You need somebody who is reliable and is keen to support botanical art and understands your requirements. Learn how to keep your subjects fresh - most artists use a fridge to maintain the freshness of their specimens overnight - but you need to work out the right temperature to get the best results! Some artists have a fridge in their studio specifically for looking after specimens/subject matter. On the other hand remember all those artists who only had dead specimens to work from! Take your time to work out your RHS project - Working out what plants or species to tackle and then how to approach your project is probably one of the most challenging parts of the process of creating an RHS Exhibit. Don't under-estimate the amount of time needed to think this through prior to making a choice. Plan ahead - If you want to portray a life cycle then you need a complete year to develop your artwork! I vividly remember talking to one RHS Gold Medal winning artist at a botanical art exhibition who was itching to get back to her garden as the long awaited blossom had finally arrived! Start with the parts that will wilt and die first - it may sound obvious, but you must prioritise on the parts of the plant which will die first. Don't forget to do colour studies and do take photographs to check shapes. Work from life and never ever rely on photographs for colour and tone. Colour and tone are always aspects of any illustration or painting which first need to be developed as studies made while observing from life. Photographic reproduction always distorts. Learn about your tools and art materials - start your botanical art AFTER you have learned about your pencils, paints and paper and developed skills in their use. Practice, practice, practice - you develop skills in botanical art through drawing and painting plants. There is no substitute for practice. Make sure you use the correct family of greens in your artwork. Don't rely on mixes or colour that you normally use or work from photos. Work from life and observe how light and shade impact on the type of green that is specific to your plant. When making a watercolour painting of a living specimen, I first study the plant from all angles—as a sculptor might study a head when making a portrait—to grasp its character … The sketch completed, I work up the "portrait" in detail, beginning with the fugitive parts such as quickly opening buds. Plants that change or wither rapidly present a very difficult problem to which there is only one answer—speed; and speed depends upon the immediate perception of the essential characteristics of the plant, a thorough knowledge of colours and colour-mixing, and a perfect co-ordination of hand and eye. Drawing from dried specimens has both advantages and disadvantages. The artist gains of course, in not having to work at high pressure for a short period; but on the other hand there is difficulty in creating the illusion of three dimensions. This can only be overcome by a thorough knowledge of botany and perspective. available in a variety of sizes and styles, in either clear or green translucent, comes in packs of approx 100 pcs per bag. The MAGIC website is run by DEFRA and provides authoritative geographic information about the natural environment - covering rural, urban, coastal and marine environments across Great Britain. ​When developing a project related to wild flowers it's essential to do some research and have a plan. The Pleasure of Sharing | Jarnie Godwin - 8 excellent and practical tips for botanical artists, particularly those working watercolour. Credits given to all the artists the tips originated from. When a flowering stem is to be drawn, and room has to be left for the addition later of leaves and fruit, it may be necessary to consult herbarium specimens to judge the space required. ​Stella Ross-Craig (1906-2006) | from 'The Twentieth Century' in " The Art of Botanical Illustration (Blunt)"
​You will see references being gradually accumulated prior to this section being written. The predominant function of thorns, spines and prickles is to deter herbivores from eating the plant. However the three terms mean different things and cannot be used interchangeably. understand the botany of thorns, spines and prickles. study paintings by those who have tackled this topic beforehand - because this is NOT a topic that many art instructors cover! In the most basic sense, thorns, spines and prickles can all refer to the sharp, stiff, woody defensive appendages found on some plants. Thorns are modified stems, as in CitrusLinnaeus. Spines are modified leaves, as in Echinocactus Link & Otto. Prickles differ in that they emerge from the epidermis, mesophyll or cortex of the plant, as in Rosa Linnaeus. about Botanical Art - drawing, painting, equipment, media etc. Trade Secrets - tips from Botanical Artists - The Irish Society of Botanical Artists asked some of their members to send us their favourite botanical art tips. Drawing Basics by Margaret Saul - excerpts from the proposed ASBA guidelines for botanical art teachers. These are guidelines being developed to assist students in attaining drawing proficiency prior to learning to work in color. If possible, avoid using multipliers eg 'x3' or 'x0.5' to indicate the size of features, as this becomes meaningless if the drawing is used in a publication and printed at a different size; the use of a scale bar is accurate regardless of changes to the size of the image. Alice Tangerini is the botanical illustrator at the National Museum of Natural History. This is a summary of her approach to drawing from specimens. draw several pencil sketches on translucent drafting film of the various parts of the plant. The Guild Handbook of Scientific Illustration, edited by Elaine R. S. Hodges, Guild of Natural Science Illustrators (U.S. This handbook is commonly regarded as "the bible" within the scientific illustration community. It covers all techniques for rendering in conventional and digital media although the subject matter is not all botanical. The book is professional and comprehensive - as one might expect from a book which covers 652 pages! ​This book is expensive - however the price needs to be considered within the context of the fact it is a professional manual for people who spend their lives on scientific illustration. Consider reviewing a copy before making a purchase. ​The fear of masking fluid - Eunike Nugroho provides tips for using masking fluid and shows you a painting in which masking fluid was applied and left for a week. The Best Watercolour Paints for Artists (currently offline while it moves to a new site) - my website about the different watercolour paints - and which are the best. BELOW is the Graphite for Scientific Illustrations - Supplement to the free Guidebook with English subtitles ​by Rogerio Lupo, Brazilian winner of the Margaret Flockton Award in 2010 and 2013. (kindly reviewed by Bobbi Angell, American Botanical Illustrator). This video lesson aims to support the study and practices of the Guidebook: Graphite and its Possibilities Applied to Scientific Illustrations. Professional artists don't just pick colours 'because it looks right'. They ALSO need to know the properties of the pigments and dyes used in creating the colour. Pigment behaviour is much more obvious when it is mixed with water than any other way of applying colour to a support. 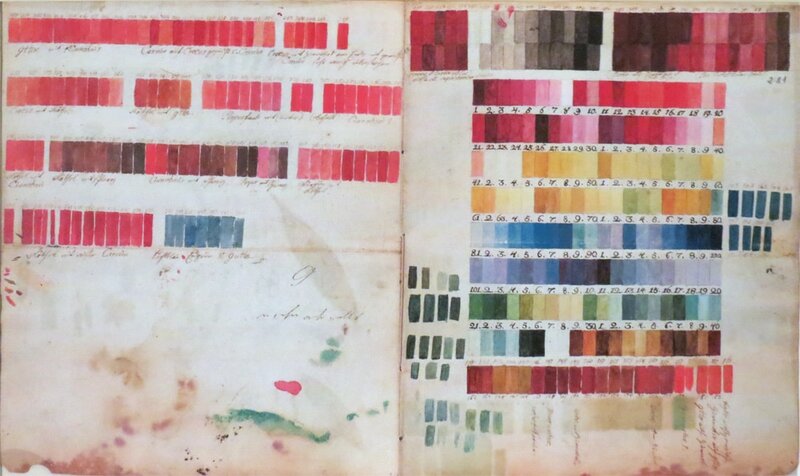 So the botanical artist MUST know in advance what pigments are in a colour and how it is going to behave - on its own and when mixed. Pigment permanency is also really challenged when diluted in water. It becomes much more important that colours used are permanent/lightfast and NOT ones which tend to be "fugitive" (i.e. tend to disappear) when diluted and used in thin glazes. Lightfastness - Is it lightfast? (i.e. Is it permanent? Will your colours fade over time? ); what ASTM grade has it achieved? Pigment properties - Is it opaque of transparent? Does it stain? Does it have a tendency to granulate? ​Margaret Best Discusses Color in Botanical Art, Provides Tips for Informal Science Educators | ArtPlantae Margaret Best is an award-winning artist whose work is held in the permanent collection at the Hunt Institute for Botanical Documentation and in private collections around the globe. Uncontrollable Color Mixing - explains the impact of mixing one type of pigment with another and why you produce mud! Artists provide tips on which watercolour papers and other supports work best for botanical art. Includes samples of how papers affect different techniques used for watercolour painting. 'Fabriano Artistico' (300 lb) is a paper which is consistently recommended by GM winners. Vellum is a byproduct of animal skins and a very different sort of surface to watercolour paper. There are different types which may or may not be treated. It also requires a particular technique - and you need to know what happens if you use paint water on the paint! Calfskin product options - this is a useful page highlighting the differences in types of vellum by William Cowley who have been making vellum in the UK since 1870. Blackberries on Natural and Kelmscott Vellum - highights the differences when painting the same subject on Natural and Kelmscott Vellum - the latter having been treated to create an even surface ready to paint. 20 Tips for Painting Better Botanicals - How To - Artists & Illustrators - Original art for sale Artists & Illustrators is the UK's number 1 magazine for original art. Buy original artwork direct from the artists. If you abuse and punish your hand or your eyes they will punish you too later. RSI for Artists generally afflicts some part of the arm - the fingers, wrist, forearm, elbow, shoulders - and can also affect the neck and/or upper back. 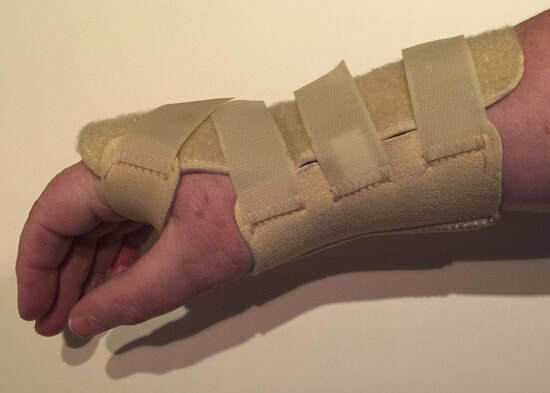 ​The critical thing to understand about RSI is that if you don't take appropriate precautions and use appropriate aids and generally treat your body well, you will become unable to use your hand for drawing or painting. How do artists make RSI worse? Continue to do whatever created the problem in the first place. 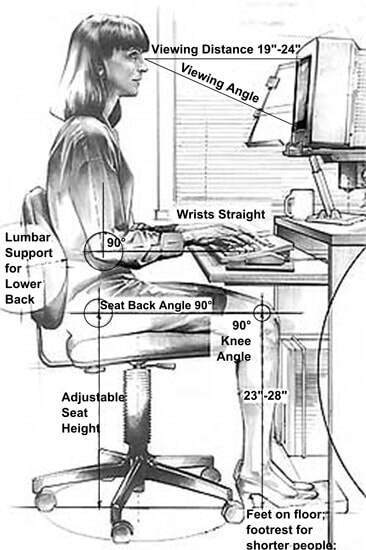 Maintaining good posture is critical to the avoidance of all sorts of aches and pains in your back, shoulder and neck. Break up long periods of sitting time with short bouts of activity and exercise. Every 30 minutes stop for just one to two minutes. You can get up and walk around and stretch your arms and hands above your head or windmill your arms. Make the blood flow! how to get prescription eyeglasses which work best for painting detail. Look after your eyes | NHS - Find out why regular eye tests (sight tests) are important and how a healthy lifestyle can help maintain good vision. 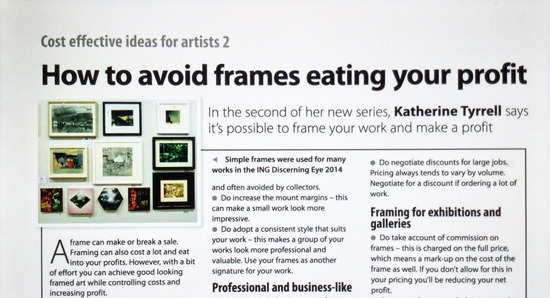 See also Tips from RHS Gold Medal Winners - and the section on How to hang and display an exhibit at the RHS Botanical Art Show which provides a lot more detail. Information about how to hang a painting can be sometimes hard to find. These are my blog posts on the topic.